There is a big change to delete text messages accidently when playing with your touch-based Android smartphone. I lost 30+ important text messages of my business partners due to the 'help' of my little baby girl. She has no clue about this and the deletion just happened seamlessly without any notice. The text messages are so important for my business that I have to get them back immediately. I downloaded and tried several data recovery tools which are recommended by my friends or colleagues. Unfortunately, none of the tools mentioned are able to recover Android text messages at the time I digged into. I had no choice and like usual, I turned to Google for further assistance, which does give me a great help to solve the problem. Android Data Recovery is an all-in-one data recovery solution developed for Android device owners. All your lost contacts, sms, media files and documents can be fully restored to your device with the help of this tool. You can get back your precious data in minutes. Moreover, 100+ mobile brands and 2000+ Android devices are supported by the software. Please download the installation package first via above links. Then install it on the computer by following the default wizard. The software will be open immediately after the installation is finished. Click "Recover" button to bring up a new window. The program asks you connecting Android device to the computer. You can do this with Android USB cable. 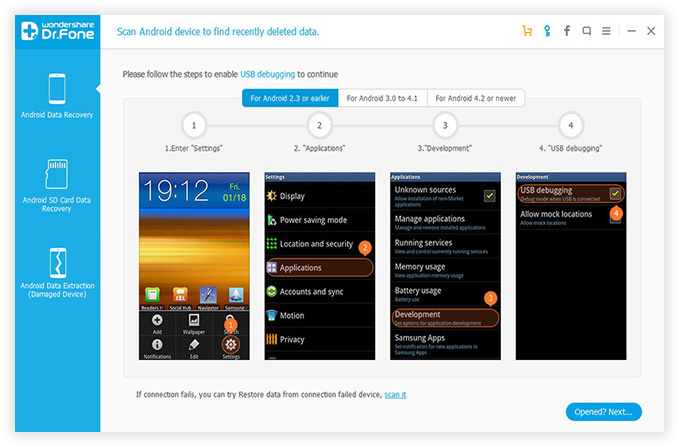 USB debugging allows computer software to access Android device in a more advanced manner for further operations. 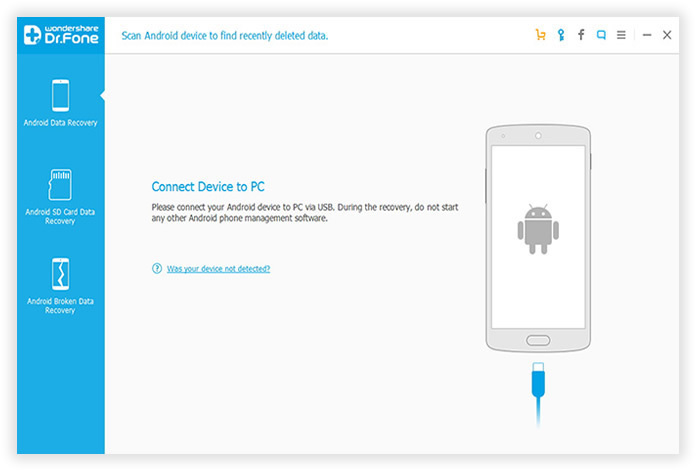 Tap "OK" on your Android phone to enable usb debugging on your device when the software asks at start up. If you don't know how to do it, please follow the instructions list below or from this guide. Click the "Start " button on the main screen to let the software scan the lost messages you deleted previously. Please make sure the battery capacity is more than 30% as it takes some time to complete the scanning. In addition, the software needs you to grant super user permission to proceed to the next step. A list of items will be displayed on different categories after the scan ended. 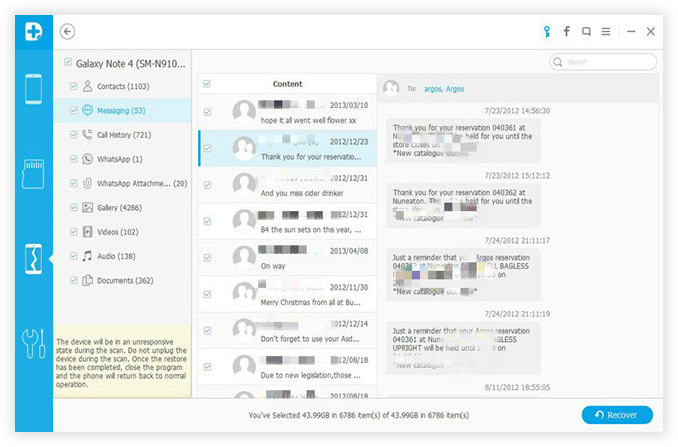 Click Messaging option on the left menu bar, and then it unfolds all of the text messages stored on your device, including the current list and deleted ones. The ones marked in red color are lost messages which is recoverable with the help of Android Data Recovery. Click "Recover" button at the bottom of the screen to start the recovering process. 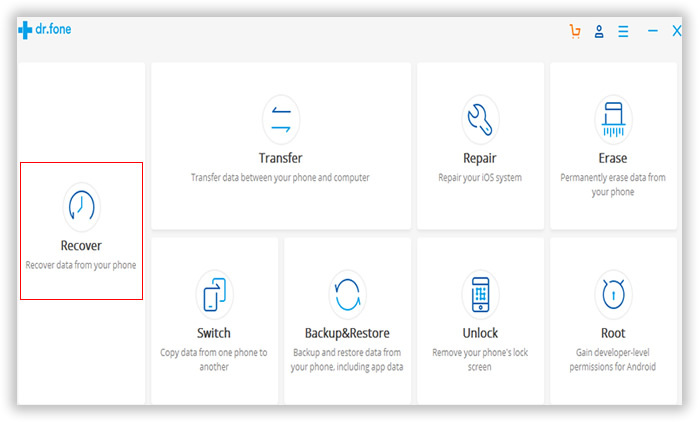 Besides message recovery, the Android Data Recovery is also capable of recovering deleted or lost contacts, photos, music, videos and documents, even WhatsApp messages are in the scope of support. 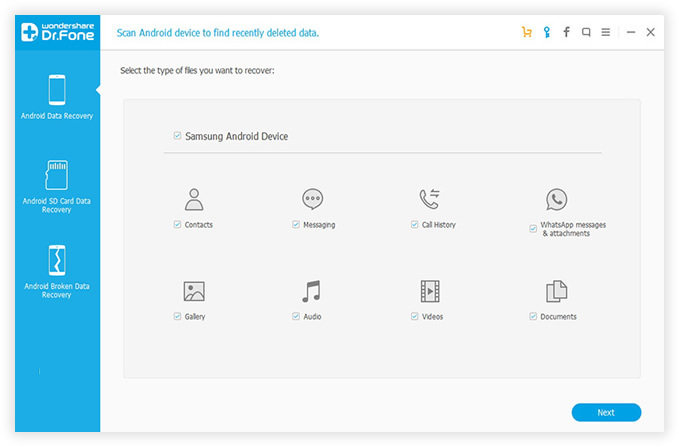 With this powerful data recovery software, you are no longer in the worry of lost items on your Android phone.